Earlier this summer I opened my voicemail to a message from my dear friend Anne, who had left a message for me during her evening commute. She called me from the side of the road after having been so deeply moved by an unexpected NPR segment on the sanitation crisis in Haiti and the courage of Haiti’s latrine cleaners, the bayakou, across the country. Unlike Anne, who has long known of SOIL’s work to transform waste in Haiti, most loyal NPR listeners in the US learned about Haiti’s sewage system – or lack thereof – for the first time that day as they listened to Weekend Edition. As somebody who has taken every opportunity over the last decade to talk about waste treatment in Haiti to anybody that would listen, I was so moved to see NPR shed light on the enormity of Haiti’s sanitation crisis and heartened by the corresponding reaction to the piece across the globe. In the weeks that have followed, I’ve heard from so many people, both friends and strangers, who were moved to action in response to Rebecca Hersher’s writing – but I also heard a lot of despair. The despair makes sense. Haiti didn’t have a waste treatment site until SOIL opened one in 2009, and both the earthquake of 2010 and Hurricane Matthew have only exacerbated the problems. Between the three waste treatment sites that now exist, only 1% of human waste is effectively treated. As the country braced for the potential landfall of Hurricane Irma, we were once again reminded of the ways in which poor sanitation interacts with natural disasters, creating the potential for protracted public health crises. With the highest incidence rate of childhood mortality due to diarrheal disease in the world and the largest and most virulent cholera epidemic in recent history, it’s critical to not to underplay the magnitude of the work ahead of us in Haiti. The road ahead to ensure that every Haitian has access to safe and dignified sanitation is long, but it’s not impossible. What I shared with those that reached out to me, hopeless, in the weeks that followed the NPR article, is what I will share with you all now: Haiti is actually taking a leading role in developing innovative sanitation interventions that are spreading across the world. Yes, you read that right! The flush toilets that most of us who grew up in the Global North are accustomed to necessitate a reliable water source and sewage infrastructure that is currently infeasible for growing urban settlements in countries like Haiti. There is also a valid argument that they shouldn’t be used anywhere as they are inherently wasteful of water and energy, but that’s a whole other issue. The usual flush-toilet alternatives, like pit latrines and septic tanks, are both cost-prohibitive and unsafe in so many global cities, like Port-au-Prince, which sit on the coast with high water tables and rising sea levels. In addition to being unsafe for the communities using them, pit latrines also create inhumane working conditions for those tasked with emptying them. My colleagues at SOIL have spent the past 5 years working alongside communities in Haiti to pioneer a third way, an alternative to both sewers and pit latrines called container-based sanitation (CBS). CBS systems are intentionally designed to demonstrate the potential for cost effective, ecologically-beneficial, and climate resilient sanitation for our rapidly urbanizing world. SOIL’s container-based toilet captures human waste in a sealable container, which is transported weekly to one of SOIL’s waste treatment facilities where the waste is transformed into organic compost. The compost returns valuable nutrients to rural farms where soil fertility is rapidly declining as crops are harvested to feed growing cities. This system replaces costly sewer infrastructure with dignified job opportunities in the sanitation sector, thereby meeting the needs of vulnerable families living in un-sewered areas, while also creating employment. Additionally, the ecological treatment of collected wastes creates a way for the sanitation sector to combat climate change and restore soil fertility through the production and application of compost, transforming a public health problem into an environmental solution. Haiti is a land of extremes, extreme beauty alongside extreme suffering, and the sanitation sector is no exception. At one end of the spectrum, the lack of dignified sanitation options is cause for despair and a global example of the risks associated with poor sanitation, and at the other end of the spectrum, Haiti’s innovation within the sector is a reason for hope, the hope that out of great need can come great innovation. Just last week in Stockholm at World Water Week, one of the largest global conferences for water and sanitation practitioners, container-based sanitation was heralded as one of the “most promising developments in urban sanitation,” demonstrating that Haiti is more than just a victim of underdevelopment, the country is actually a global pioneer of technologies which have the potential to save lives in dense urban areas around the world! With over 1 billion people worldwide living in informal urban settlements, and these numbers expected to double by 2050, human rights advocates and governments are actively seeking sanitation solutions to stave off the massive public health emergencies that can result from poor sanitary conditions. 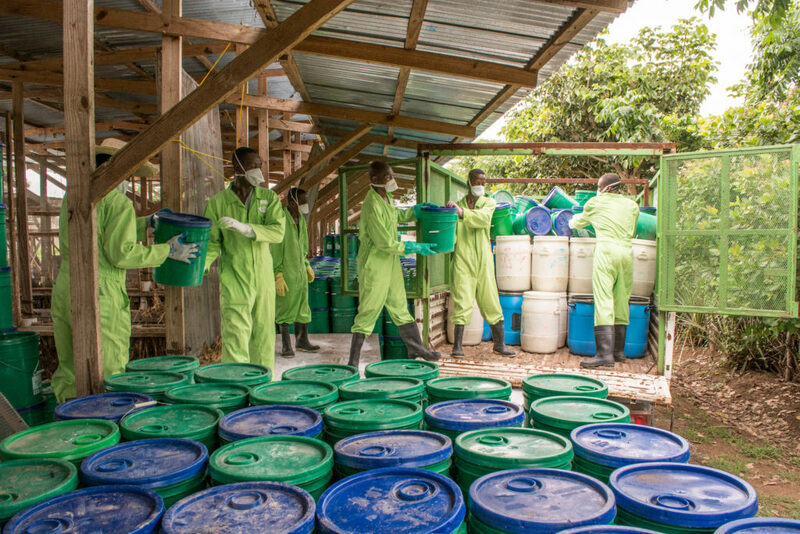 The innovative sanitation work that is underway in Haiti is part of a global effort to rethink sanitation to meet the needs of rapidly expanding communities worldwide and to promote the transformation of human waste into a valuable resource for combatting climate change and restoring ecosystems. SOIL is proud to be a founding member of an alliance of sanitation providers working on developing this new approach to sanitation in different urban contexts across the globe. In 2016, SOIL, along with Sanergy, Sanivation, Loowatt, Clean Team, and x-Runner, came together to establish the Container Based Sanitation Alliance (CBSA). The vision of the CBSA is a world where access to dignified, safe and affordable sanitation is no longer out of reach for families and communities in dense urban areas. The CBSA has been gaining global traction and is taking step towards the formalization as an accepted global technology and the wider adoption of CBS by governments around the world. When the task to manage waste in a country like Haiti feels too enormous, my colleagues and I come back to this line time and time again: “kaka kapab,” which is a catchy phrase that essentially means “poop is capable” in Haitian Creole. We firmly believe that waste can be harnessed to restore and revitalize, instead of perpetuating disease and degradation. One of my personal heroes, DINEPA’s Edwidge Petit, is indeed what Rebecca Hersher called her: “Haiti’s sanitation champion.” Her fortitude and determination to transform Haiti’s sanitation system inspires me day in and day out. SOIL is honored to work in direct collaboration with the Haitian government towards our shared goals of building a world in which everybody has access to safe sanitation, a world in which human waste is a catalyst for job creation and ecological restoration. Kaka kapab! No Replies to "What You Do Want To Know About Haiti's Sewage Problems"